grid-tie inverter does it work? is it worth it? Just a quick overview of what I’ve learned about “grid tie inverter” Basically it’s a device that allow you sell sell back electricity you produced to your power company simply by plug-in the power to the power outlet from the grid tie inverter. Remember only grid tie inverter can do this, not just any ordinary inverter. So the question. Does it work? Based on my research, via google search and youtube video. It appears to work, or I can also say safe to say, it does work. Wind Turbine, Solar Power, any power source that can hook up to the grid tie inverter terminal that produce electricity will work. The service electrical panel meter from your municipal power or power company will reverse, that’s right! the power meter will go backward. 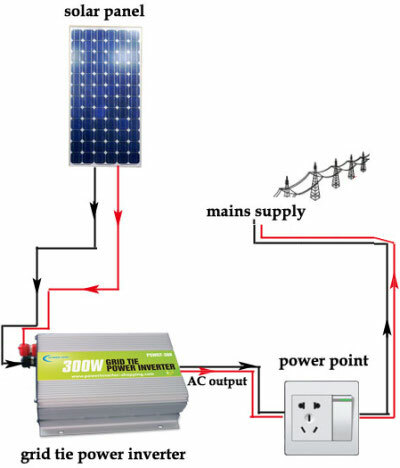 So let say you can source power from solar panel 200watts, that’s 200watts, and if consistently generated, it will push your meter backward 200 watts, not a lot, but it work, and if you have a lot of power sources to the inverter, you will see the meter go backward thus reducing your electric bill. Second question, Is it worth it? to me NO! because the inverter cost money, the power sources from solar power, wind turbine, whatever cost additional money to get it, and off course the installation accessories as well. So today, it might not be cost effective, but maybe in the future the solar panels or wind turbine cost will get lowered or the power company increased electric bill per kilowatts then it’s worth it to buy the inverter and related equipment. This entry was posted in Computers, Entertainment, Science by admin. Bookmark the permalink.